Casemachine, LLC earlier revealed that a composite case series will be released for different smartphones, including a G4 Evolution case for the Samsung Galaxy S4. The company’s chief mechanical designer now confirms the composite case will be made available for pre-order soon. Following the successful releases of the Casemachine Berlinetta case for Apple iPhone 5 and the i5 Slimline v2, Casemachine announced earlier last month that a new composite case series will be released which will be called the Evolution case series. The Evolution case series will comprise of different slip-on TPU-Polycarbonate hybrids designed specifically for the Apple iPhone 5, the HTC One, the iPad Mini and the Samsung Galaxy S4. For Samsung’s latest flagship, Casemachine codenamed its Evolution composite case the Casemachine G4 Evolution case for Samsung Galaxy S4. 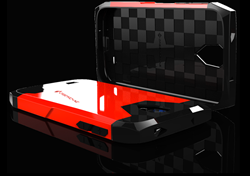 The case will have a racecar inspired design exuded with a interchangeable snap-on polycarbonate outer shell and TPU chassis. Casemachine states only the most durable TPU will be used on the new G4 Evolution composite case. Casemachine’s chief mechanical designer was heard to have said that the purpose of the new composite case was to provide something durable and premium for Galaxy S4 users. While Samsung has gone “green” with its strategy and has produced the S4 with recyclable polymers, Casemachine has now tried to create a phone case which can provide a much more exotic feel to the touch without taking away the phone’s inherent beauty. The company is set to release the whole new Evolution composite case series for different flagship smartphones, though Casemachine’s president and chief mechanical designer have stated that the Casemachine G4 Evolution case for Samsung Galaxy S4 will be released for a pre-order batch soon. As of now, extensive drop and scratch resistance testing is being performed on the new Evolution composite cases at Casemachine’s headquarters in Miami, FL and the company is assuring that a tighter grab on smartphone is provided by the introduction of premium TPU and polycarbonate polymers in the Evolution case series. The Casemachine G4 Evolution case for Samsung Galaxy S4 will have an interchangeable polycarbonate outer shell which could easily be taken off and put on by users without the use of adhesives. The outer shell will be to provide a more robust and hard feel of the case in contrast with the touch-friendly TPU body of the case. Casemachine will also use high line automotive PPG coating on the outer shells for an everlasting gloss and brilliant finishing. The polycarbonate outer shell will be made available in different shades taken off of various official paint codes of some of the most exotic racecars on Earth. Casemachine is determined to officially launch the whole Evolution case series later this year and anticipates a warm reception for it by smartphone users all around the world. For further information regarding the Casemachine G4 Evolution case for Samsung Galaxy S4, please contact the customer support staff at 305-818-9933.